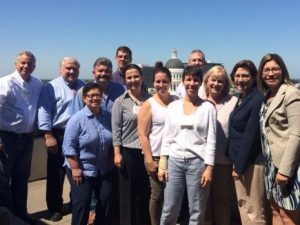 The first group of st ate officials to participate in the Milbank Memorial Fund’s Emerging Leaders Program (ELP) completed the interactive course in late June at an in-person meeting held in Sacramento, California. The program, developed in 2015 by the Fund and its Reforming States Group (RSG), is designed to bring together individuals from the executive and legislative branches of state government to develop skills that will enhance their effectiveness as leaders in addressing the challenges of today’s complex health policy environment. Modeled after the RSG, the ELP fosters the same type of learning and networking experiences for young leaders around the country. With class size held to around 20, participants completed three in-person meetings and two virtual sessions since 2015. Group members hailed from Arkansas, California, Colorado, Idaho, Iowa, Kansas, Louisiana, Maryland, Minnesota, Nebraska, Oregon, Tennessee, Washington, Wisconsin, and Canada. In order to participate, participants were nominated by state health policy leaders from the RSG. The curriculum at the last meeting in June focused on advanced negotiations, a topic which grew out of the previous meeting and was requested by participants. The curriculum was led and developed by Ken Kizer, MD, MPH, director of the Institute for Population Health at the UC Davis Health System, and Rich Callahan, DPA, professor and chair of the Department of Public and Nonprofit Administration at the University of San Francisco. Participants, many of whom noted that they hadn’t had any prior or formal training in negotiations, were especially pleased to engage with faculty who spoke about their own experiences with relationship- and consensus-building, often with legislators. As one participant said, hearing about the personal experiences of faculty members helped reinforce lessons from the sessions. The program also includes a mentorship component, in which participants are matched by interest and location with state leaders interested in helping the next generation of leaders. “It’s been gratifying for us to see how many former and current RSG members want to ‘give back’ and remain engaged with the RSG and the work of the Fund,” said Trina Gonzalez, program officer at the Fund, who leads the ELP. In addition, the first group is also interested in forming an alumni network to remain engaged with one another and with the Fund.